Looking for Canning Tomatoes: Common Problems Answered (Separation of Liquid, Spoilage, Etc.) in 2019? Scroll down this page and follow the links. And if you bring home some fruit or vegetables and want to can, freeze, make jam, salsa or pickles, see this page for simple, reliable, illustrated canning, freezing or preserving directions. There are plenty of other related resources, click on the resources dropdown above. Can I can my own salsa recipe? Salsas are usually mixtures of acid and low-acid ingredients; they are an example of an acidified food. The specific recipe, and sometimes preparation method, will determine if a salsa can be processed in a boiling water canner or a pressure canner. A process must be scientifically determined for each recipe. To can salsa at home, use our recipes for Hot Chile Salsa or Mexican Tomato Sauce. Your County Extension agent may have additional tested recipes for salsas. Why do my tomatoes separate from the liquid? 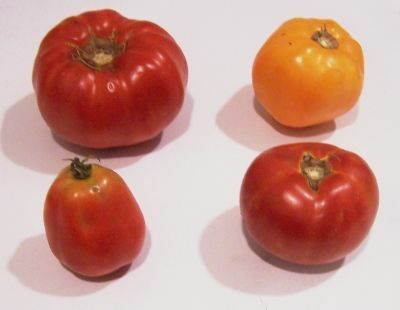 A frequent problem is the separation of water from the tomatoes. Why does the water separate from the solids in tomatoes? Home canned tomatoes, tomato juice, and tomato sauces with liquid at the top and solids at the bottom is quite normal. It only reflects that the juice was made prior to heating. For example, the tomatoes were chopped, run through the steamer, sieve, or food mill while still raw and prior to heating. As soon as they are chopped or crushed, enzymes start to break down the pectin that helps to hold tomato cells together. The enzyme that causes separation is activated by exposure to air and inactivated by heat. In commercial production, tomatoes are flash heated nearly to boiling in a matter of seconds, using equipment not available to consumers. Because the pectin holding tomato cells together is not exposed to air when cold, it remains intact, and a thick bodied, homogeneous juice is produced. The solution is to leave tomatoes whole or in large chunks (do not chop). Heat before chopping or juicing to minimize the separation. The best way to do that at home is to heat quartered tomatoes quickly to boiling temperatures WHILE crushing. You can also heat the blanched, peeled whole tomatoes in the microwave, then crush them! Make sure the mixture boils constantly and vigorously while you add the remaining tomatoes. Simmer 5 minutes after all tomatoes are added, before juicing. If you are not concerned about juice separating, simply slice or quarter tomatoes into a large saucepan. Crush, heat and simmer for 5 minutes before juicing. What about the reverse: liquid at the bottom and solids at the top? That indicates too much preheating (more than 5 minutes). Pectin breaks down when it is overheated; then separation results. If separation occurs, just shake the jar before opening or decant the water off. Which is better: Canning or freezing tomatoes: I'm interested in canning or freezing tomatoes, which is best? I would primarily be using them for my chili recipe, which I normally use canned diced tomatoes. Second question, can I dice the tomatoes before freezing or canning, or should I just quarter them as you recommend and then dice them when cooking the meal. If you plan to later cook with the tomatoes, freezing retains the flavor best. If you will be using then uncooked (for example, on a salad), canning is a bit better at retaining the texture. So, for you chili recipe, I would freeze them. You can dice them before you freeze them; that would probably be easier! Can you freeze the tomatoes and then use them later to make a large batch of spaghetti sauce, salsa, etc. and then either can or re-freeze? Sure! If it is just a matter of days or a few weeks, that works great. I just do the prep steps to the point of producing the prepared pulp (through step 7 on this page http://www.pickyourown.org/canning_tomatosauce.htm ) then freeze in a ziploc bag until I have enough to them heat them altogether and finish the process. 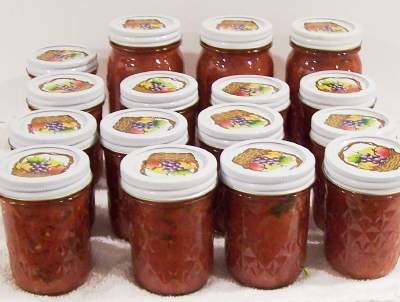 Can store-bought canned tomatoes (diced, crushed or whole) be used in place of fresh tomatoes for your pizza sauce or pasta sauce w/no meat recipes, and then canned? Will the taste/consistency be ok, or will they be cooked too much? Yes, you may use canned tomatoes. Of course, every time a fruit or vegetable is canned, there is some reduction in quality. How much, and whether the finished product will be to your liking, or better than a commercially available product is subjective and hard to say. But if you follow the directions I publish (which closely follow USDA and Ball tested standard recipes) it will be safe. Try it and see how you like it! You will certainly be eliminating the commercial chemical additives! I have lots of little grape tomatoes. Can I dry them? Certainly! Grape and cherry tomatoes are not the ideal candidate, since they have a lot of water and seeds, but they'll work! I heard tomatoes are high acid, but your website says they are low acid and require the addition of lemon juice. Which is it, and what type of canner is required? That sounds like confusion between low acid and non-acidic. High acid foods can be safely canned in a water bath canner. Low acid foods may need the addition of acids like lemon juice or vinegar to acidify them enough to be canned in a water bath canner. Non acidic foods require the pressure canner. And this page provides an excellent explanation about why lemon juice is added to tomato products. Forgot to add lemon juice: I made and canned my first tomatoes and salsa. I totally missed putting lemon juice in at the end. Are they ruined? Will they spoil? or am I ok to eat them? I did not know what to do. I didn't know if they can be opened and re done in the water bath after adding lemon juice. I feel horrible for missing that step. First don't panic. People have canned tomatoes for generations without adding lemon juice. Lemon juice is added to increase the margin of safety. 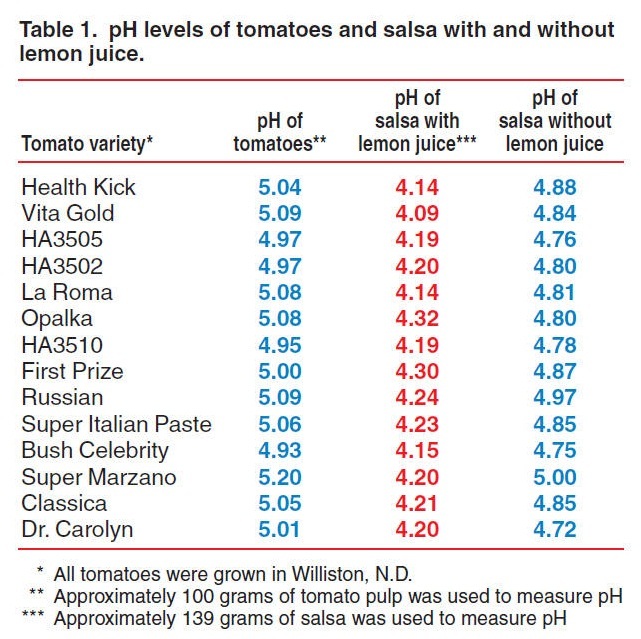 They USDA started recommending this when they realized that some newer varieties of tomatoes (like the yellow ones) are lower in acid. Don't get me wrong; I do think you should include lemon juice (it's a very small amount that won't be noticable in the taste), but I wouldn't panic over forgetting it once! I recently canned tomatoes but had one little jar that I didn't have room for in the water bath. So I decided to just refrigerate it. All I've done to those tomatoes is blanch them -- haven't cooked them, stewed them, done anything else. There is some lemon juice in them. They've been refrigerated since I packed them -- how long will they be okay to use? They'll last about the same length of time that a can of tomatoes from the grocery store will last once you open it an put it in the fridge. I'd guess a couple of weeks, but that depends on how cold your fridge is. Lids Popping Off: I made tomato sauce for the first time last week and canned it. Everything seemed fine after a couple of days so i put them in the cupboard. now a week later the lids are randomly popping. should I re water bath the whole batch? No, it is too late to re-bath them; that can only be done within 24 hours after the first processing. If the jars were mine, I would discard the entire batch. Obviously there is spoilage going on, at such a high rate, as to indicate that there is something fundamentally wrong with that batch. Cream of tomato soup: I know it's unwise to can soups that contain cream or dairy because of the safety. But I'm trying to figure out how I can can cream of tomato and cream of mushroom soups. Can I use soy milk instead? Can I use a water-bath canner instead of a pressure canner for low acid foods like green beans? Jars, Lids and Containers and popping noises!